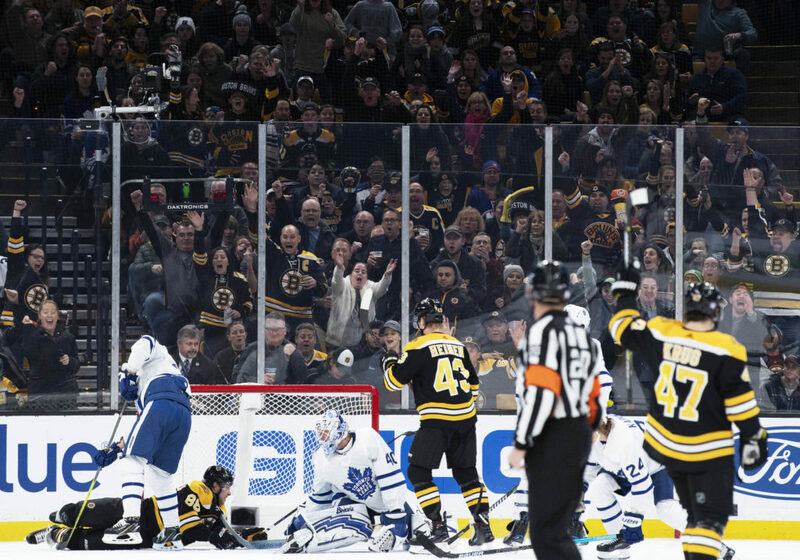 After a disappointing loss to Vancouver this past Thursday night, the Bruins put out all the stops last night at the TD Garden. And once again, the first-line lead the night as both Patrice Bergeron and David Pastrnak dazzled with goals and assists. The 22-year-old Pastrnak would score his third career hat trick. Bruins goaltender Jaroslav Halak also had quite the night with a stellar comeback, making an incredible 40 saves. 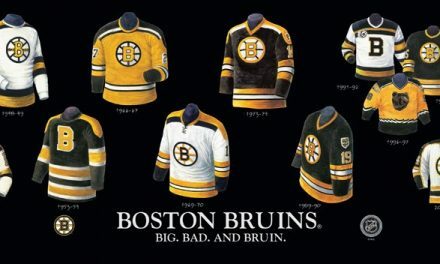 The Bruins would give Toronto their first loss on the road in seven games. Backup goalie Garrett Sparks was in net for the Leafs. In the first 15 minutes, the Toronto Maple Leafs came out blazing and put Halak to the test hitting the net with a flurry of pucks. The Leafs kept the B’s at bay, limiting them to only six shots on goal compared to Toronto’s 20 shots. The 33-year-old Halak kept his demeanor and soon enough Boston was able to find its legs. Patrice Bergeron got the Bruins on board first when he scored off of a tip-in pass by Pastrnak at 16:12. 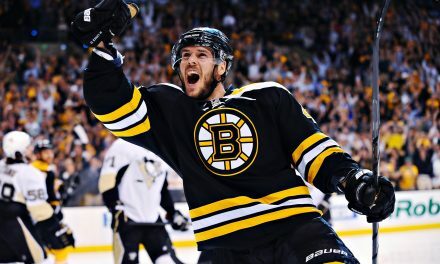 After the first goal, there was no looking back for the B’s. 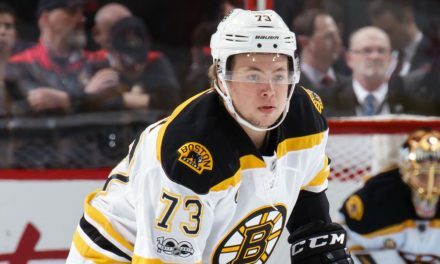 With the second period underway, the Bruins kept charging forward and David Pastrnak would score his first goal of the night at 5:46 with a Bergeron and Matt Grzelcyk assist. Toronto’s Martin Marincin got a holding penalty in the second that lead to a Boston power play goal: Pastrnak would score off a wrister with both Brad Marchand and Bergeron notching assists. However, the Maple Leafs tried to make a comeback and with a few seconds left to the second period, John Tavares would score the only goal of the night for Toronto. Heading into the third, Boston led Toronto 3-1. 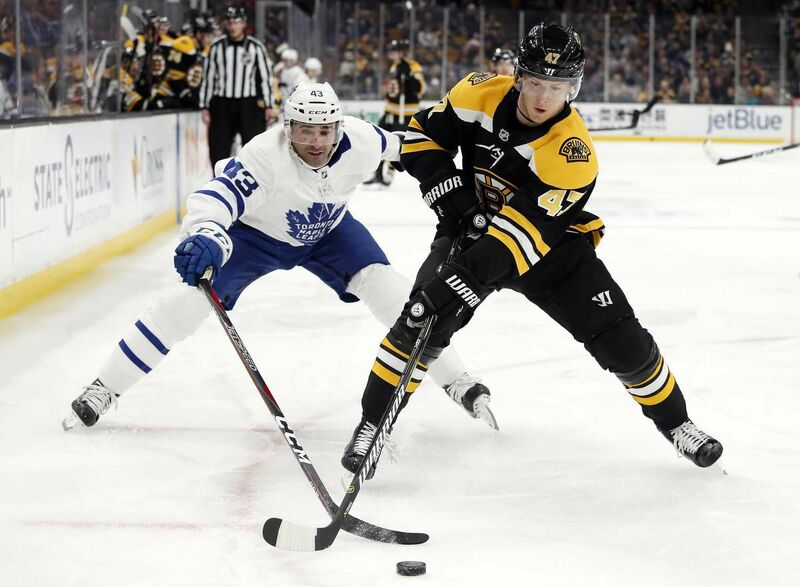 With about 8:32 left in the third, the Leaf’s Kasperi Kapanen would be in the penalty box, charged with a double minor for high-sticking on Bruins John Moore. The Maple Leafs were shorthanded for four minutes and Boston took full advantage. In his second hat-trick of the season, David Pastrnak would score another power-play goal with the assist by Marchand and Torey Krug. Within seconds, Boston’s Joakim Nordstrom would score off a wrister making the final score 5-1. As for Boston, who have been without a few key players, Providence players were called up: Dan Vlader (Goaltender) and Jakob Forsbacka Karlsson (Center). Karlsson has 11:19 minutes on ice. Pastrnak now leads the league in goals with 15; Bergeron is tied for first in the league and the team with points (24). Halak is second in the league for GAA (Goals Against Average) with a 1.86. He is also third in the league with regards to Save Percentage at .942. Toronto had 41 shots on goal, while the Bruins had 34 shots. So @pastrnak96, how'd you get ready for tonight's game? 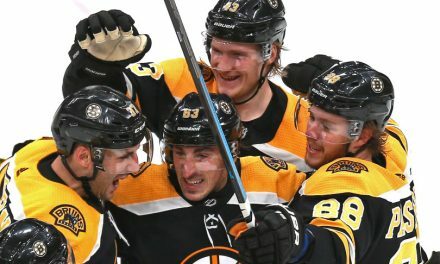 The Bruins will again be on the ice tonight at the TD Garden as they host the Las Vegas Golden Knights, who are coming off a 5-4 loss against the Montreal Canadiens last night. For the Knights, tonight will be the last game of a four-game road trip against an Atlantic Divison team. Both Jonathan Marchessault and Max Pacioretty are players to keep an eye on. William Karlsson is also having a good start to the season as he is second behind Marchessault in team points. Vegas is seventh in their division with a 7-9-1 record, while the Bruins are fourth in their division with a 9-5-2 record. PUCK DROP: TONIGHT at 7:00 pm, TD Garden.